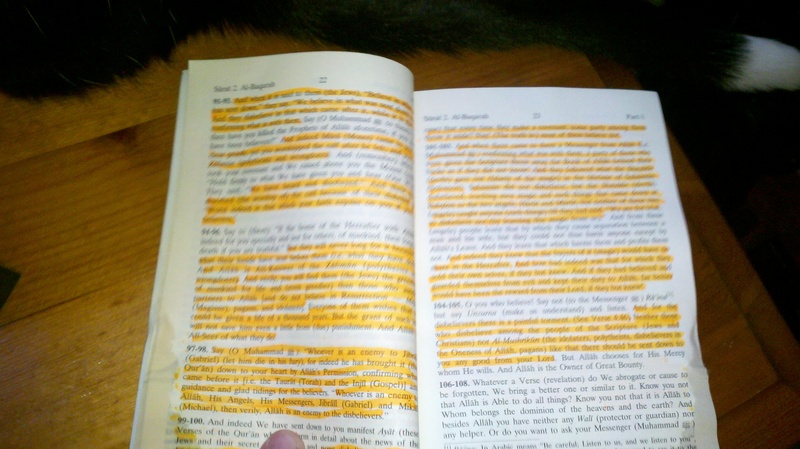 My Muslim roommate gave me a copy of the Quran, telling me that if I read it I will “surely become a Muslim, as everyone who studies religion will find the truth in this book.” I spent two evenings reading it in its entirety, but after only two minutes I noticed something peculiar and grabbed my orange highlighter. It’s soiled because even my cat (tail pictured) thinks it’s BS. So he knocked over my water while I was reading it. The image above shows two typical pages in the Quran. The highlighted sections are passages in the Quran that espouse violence against nonbelievers, calls them idiots, or promises that Allah will torture them in fire forever. This, quite literally, takes up about 60% of the Quran. Nonbelievers (also called “enemies,” “wrongdoers,” and “mischief makers” in the Quran) are identified as Atheists, pagans, polytheists, Jews, Christians, and spiritualists who have heard even a “partial truth” from Muhammad, but who “refuse” to acknowledge “what they know is clearly true.” Of particular note, Muslims who kill Muslims are condemned to hell, but are still treated better than nonbelievers because Allah will pardon them after Jesus is resurrected and Allah commences his final judgement. Why does the Quran say these things? Well, it elaborates. According to the Quran, because I’ve read even a single word from the Quran, I am now a Muslim and a believer. But because I refuse to acknowledge that, I am disobeying Allah. Sorry Quran, but I’m still 100% atheist. But really, a book should stand on its own merits, not empty threats. And the Quran is filled to the brim with empty threats. More than half of the damned thing is passages condemning disbelief. Could it be that it contains so many threats against nonbelievers because Muhammad made the whole thing up and felt insecure? Finally, I suggest that everyone read the Quran. It’s pretty hilarious! This entry was posted in Atheism and tagged Allah, Atheism, God, God of Abraham, Islam, Muhammad, Quran, Religion, The Prophet Muhammad, the Quran. Bookmark the permalink. I haven’t read it, but that doesn’t sound like the so called “peaceful religion” they keep telling us it is then? To me that sounds more like a problem for Muhammad than a problem for the rest of us.